Some are famous anglers. Some are not. Some fish off local piers and beaches. Some fly around the world to wet a line. Some like to wade. Some fish out of kayaks. Some off paddle boards. Some troll from expensive yachts. Some fish with bait, others with flies, others with plugs. Some hold impressive world records and routinely release their out-sized catches. Others fillet their fish and relish cooking and eating them. Some of the women featured in this book have enjoyed privileged lives. Others come from modest backgrounds. A few have suffered from depression and have found solace and healing in running rivers. Some are natural teachers. Some are fishing guides. All are intelligent. All are adventurous spirits. All love to be on or in the water. You will find their personal stories fascinating. Although one in four American anglers is a woman, until recently fishing for sport—especially for prized game species—was considered by many a “man’s game.” In this sweeping portrayal of the lives and passions of 50 extraordinary female sport fishers, Steve Kantner puts to rest that myth forever. As these diverse and vivid portraits show, women are not only highly accomplished on the water, they are increasingly active in efforts to protect and restore the aquatic ecosystems and wild populations of fish on which the entire sport depends. 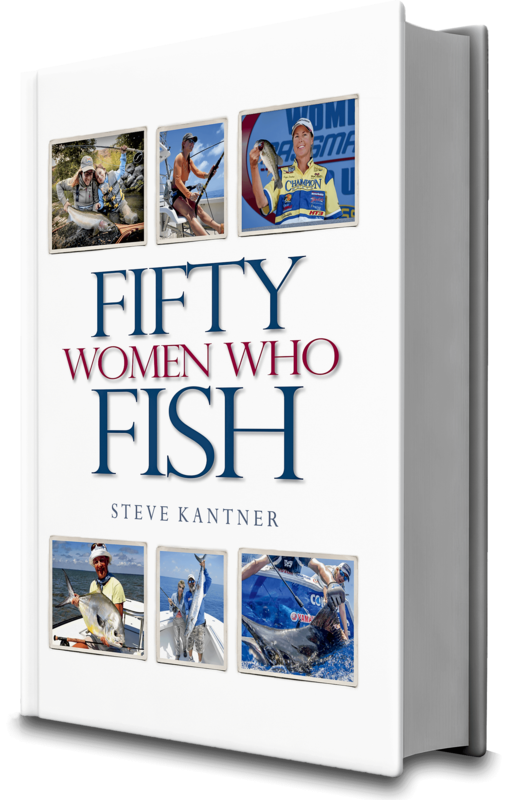 Kantner spent two full years interviewing devout female anglers far and wide, from the Florida Keys to Alaska, for this groundbreaking new book. He lives in Fort Lauderdale, Florida. I think many of the women featured in Fifty Women Who Fish were made to feel their place in the fishing world was not a given—it had to be earned. However, as Steve Kantner makes clear, that particular glass ceiling has been resoundingly shattered, reduced to the millions of grains of sand from which it was molded. I feel a kinship with each of the women in this book. I count many of them as my friends. They, too, have followed their passion, whether on a shoestring budget or blessed with unlimited funds. They have distinguished themselves as research scientists and environmentalists, tirelessly searching for ways to sustain fisheries and protect habitats; as guides and boat captains; as champion casters and able teachers; as record holders and innovative tackle designers; as lodge owners and at the oars of a drift boat; or simply as quiet pursuers of a sport that takes them out of doors and far away from the din and pressures of everyday life. As for the author, well, he’s chatty, wonderfully quirky, and always ready with a laugh or another story. Steve knows his stuff. He does justice to these women’s narratives and their legacies. I have thoroughly enjoyed being associated with this project and I’m delighted, as this important book nears publication, to call him “friend,” even though we’ve yet to meet!